Rita Jeptoo at the Boston Marathon finish line in 2014. There is closing speed. 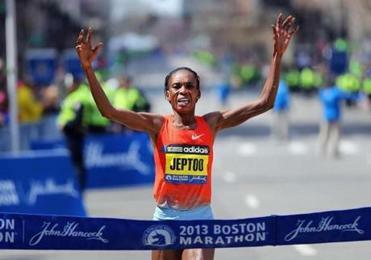 And then there is how Rita Jeptoo finished last year’s Boston Marathon. On her way to a third Boston title, Jeptoo covered the final 3.2 miles in 15 minutes, 56 seconds, including a 4:48 split for Mile 24. Men’s champion Meb Keflezighi covered the same stretch on the same day in 15:49. Let that sink in. Or not. In the immediate aftermath of the 2014 race, the splits Jeptoo posted shocked and rattled many elite female marathoners. They talked about Jeptoo and her course-record 2:18:57 in awestruck tones. The word unbeatable was uttered more than once. Now, one year and two positive drug tests (“A” and “B” samples) later, her competitors see Jeptoo’s stunning final miles as a red flag, a chemically assisted performance, a first indicator of the doping scandal to come. 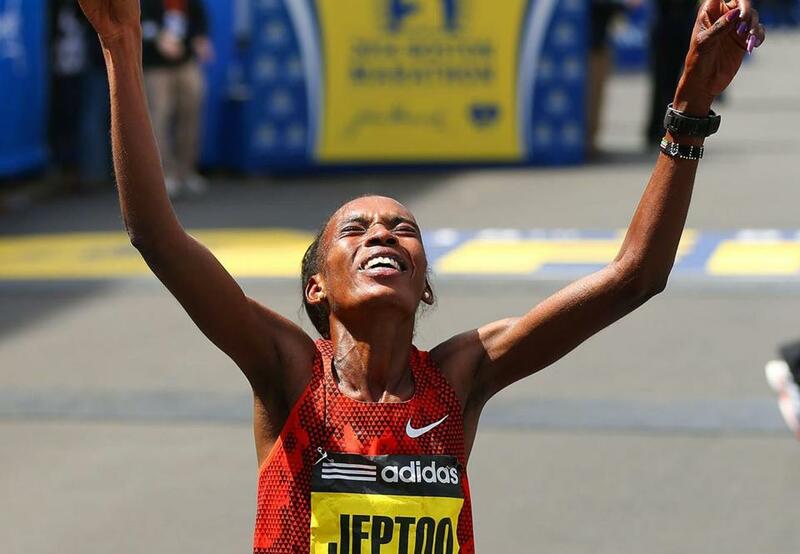 It’s frustrating because female elites believe Jeptoo’s two-year suspension from competition doesn’t go far enough, because a positive test for the blood-booster EPO in September 2014 can not void the Boston course record set five months earlier. The Abbott World Marathon Majors will pay for out-of-competition testing for approximately 150 top runners. Shalane Flanagan would like lifetime bans for Jeptoo and others caught doping. Also, she sees last year’s runner-up, Buzunesh Deba (2:19:59), as the true Boston Marathon women’s course record-holder. Desiree Davila Linden said she has “put an asterisk” on the Jeptoo mark. She knows it’s a tricky situation because there are no positive tests to back up strong suspicions that Jeptoo cheated her way to the Boston record or earlier Boston titles. Flanagan sometimes reviews how she raced and finished the Boston Marathon in 2013 and 2014 and imagines how it would have been different without Jeptoo in the field. If Jeptoo doped before the 2013 race, then Flanagan should move up from fourth to third place in the official results. More than that, Flanagan saw Jeptoo’s strong closing speed for the first time in 2013 and planned accordingly for 2014. Flanagan sped through the early miles of last year’s race, notching a 1:09:27 half marathon, because of Jeptoo. But the fact that the testing system caught Jeptoo led some to see a positive side to the situation.